We are treading deeper into the book of Acts and, as we do, we notice that the intensity of attacks against the early church have increased. Those attacks came from outside the church and even came from within it. Yet despite all this opposition, the Church continued to gain momentum and grow both in its width and in its depth. That has been the story of the church for the last two thousand years, as Christ’s kingdom is received and God’s plan to reconcile and restore His creation advances. There is no way the church born in Acts would have survived without God’s sovereign hand moving it forward and providing for it’s every need. Oh how I pray that God would provide us, here in Goffstown, with the kind of momentum experienced in that early church. How I long to see us grow as they did, in both width and depth. While today, we are hardly experiencing the fruit of great revival abundant in the church of Acts, we should not for a moment think that God cannot do a great work of revival and awakening in our day using us. For the God of the book of Acts is the same God we worship and trust our lives to today. So, it is in no way a huge leap to believe that God can move our church forward and provide for our every need using the same means He did with our spiritual fathers almost two thousand years ago. Church history reports that God has done surprising works of revival time and time again in in the worldwide church and even at the Congregational Church of Goffstown. So how will we know when revival has begun in Goffstown? What can we expect God to do and what part do we play in it? The answers to those questions will be our focus as we continue in the book of Acts this Sunday morning at 10:30. I hope you can be with us! Church was Great! Let’s Not Talk About it. Holy week will soon be upon us, which means we will be celebrating the resurrection of Jesus Christ, our greatest hope for this life and the next. Resurrection (Easter) Sunday, along with Christmas Eve, is also one of the best attended days of the church calendar, largely because people who don’t often come to church realize, to varying degrees, that it is an important day. 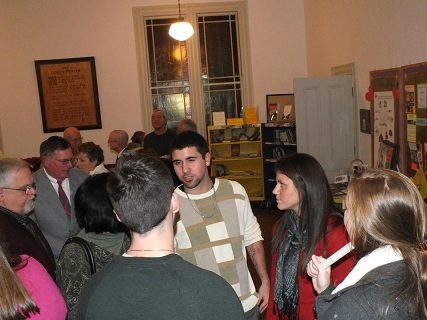 This past Christmas Eve the vestry was full and overflowing with guests who joined us in fellowship. A recent blog posting by Colin Marshall really got me thinking about the fellowship time we share, over a cup of coffee or sweets, after each Sunday morning service. It also got me thinking about the impact we could have following our Easter services, which are coming up just a few weeks from now. Marshall wonders how it is that “we’ve listened to the Word of God read, heard it proclaimed, sung the praises of our Great God and petitioned Him for mercy in our time of need, and yet we spend the time afterward talking about last night’s movie, the game, the hobby, the state of the nation, or whatever “anything” but the great truths of the Gospel we’ve just heard and by which we’ve been saved?” Of course we want to get to know others better and deeply care about wellbeing, but why is it we still feel uncomfortable striking up conversations about the God we’ve just worshiped together? What better and more natural place to have these conversations than in church?! Even those who are visiting showed up because they have an interest in seeking, hearing from and possibly worshiping the same God who called us here. At the very least they are at a place where they are now open to talking about Him. As the author to the book of Hebrews reminds us, we all called to “stir up one another to love and good works, not neglecting to meet together, as is the habit of some, but encouraging one another.” That encouragement, to put the verse in context, comes from the Gospel. The job of encouraging one another in the faith is not just that of the elders, deacons or the pastor. You and I are each called by God to do this. It is not that we don’t want to do this. Sometimes we just don’t know where to start or what to say. • Pray during the service that God would lead your conversations, and pray for specific people around you. • Listen to what God is saying to you through the sermon, songs, call to worship, prayers, and so on, and formulate a comment or question to start a conversation. Pick out two things to try as conversation-starters after church. • Even if the conversations don’t always get off the ground, your enthusiasm for learning the Bible and knowing God will be contagious. And non-Christians will see that church isn’t dull and boring but fascinating and life-shattering. • These intentional conversations after church will sometimes lead to prayer for one another. Why not stop for a moment and give thanks or petition God for some need? • Another way to deepen our fellowship is to ask each other how we came to salvation in Christ. Sometimes we’ve been in church with people for years without ever learning their story. The other day at church I asked a guy named Phil how he became a Christian, and we discovered God had worked in us in very similar ways as young men. The door is now open to building a friendship with this brother. What a joy! So remember, lots of people will be visiting our church on Easter Sunday because they know it is a meaningful Christian holiday. Join me in showing them the love of Christ, as the body of Christ, by welcoming and engaging them in meaningful conversation. I can’t think of a better way to engage and edify our guests (and each other) than by discussing the significance of that day. You might even ask, “What brought you here today?” The benefits of your conversation will extend far beyond the several minutes you will share that day. Who knows, it may even extend into eternity! This week’s passage in the book of Acts is, I must admit, not one I would randomly select to preach on. That’s one of the good things about preaching through entire books of the Bible; the pastor cannot pick and choose the topics and individual texts he wants to preach from. Instead, the Holy Spirit charts our course through God’s word, causing us to receive more of the whole counsel of God. 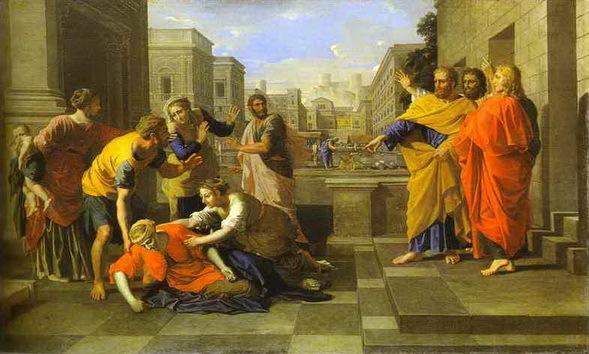 If Luke was making up or trying to sanitize the life of the early church, he certainly would not have included the story of Ananias and Saphira. Or if he did, he would no doubt have reshaped it to include their repentance and restoration to the covenant community of Christ. But the story of Ananias and Saphira did indeed happen and it happened exactly as Luke reported. Clearly, it is a story that God wants each of us to know about. All the trouble the early church faced, to this point, came via threats and persecution from those outside the body of Christ. But now the church would face its first bout of a long line of trouble from within. Satan’s strategy is to deceive, and what better way to deceive Christ’s church than to infiltrate and corrupt it. As you approach the text, you may find it helpful to ask, “What do I learn about myself, God and the church in the story of Ananias and Saphira?” The more time I spend in this passage, the more I understand why it is indispensable to the book of Acts and the life of the church. Join me on Sunday morning, at which time God’s word and Spirit will teach, encourage, convict and train us up in righteousness, that we might be complete and equipped for every good work God has prepared for us. It’s that time of year when W-2’s and other tax statements come rolling in and we go through the annual process of filing our federal income tax returns. Caroline and I are able to claim our daughters as “dependents” on our tax return for a few more years, which definitely helps ease the tax burden. While our daughters are independent in so many ways, they still look to us for a certain amount of financial dependence, and we expect them to do so until they are able to enter the workforce after they graduate from school. If God were to file a tax return (yes I know that’s theologically incorrect and, as far as I know, the government hasn’t requested He do so! ), He would claim every one of us as “dependents.” Unlike our children’s relationship to us, we are COMPLETELY dependent on God. We are dependent on Him for our lives, our sustenance and our salvation. Some may argue and say, “I am not dependent on God!” But that is not a true statement. While some may not recognize or act as if they are dependent on God, we all are dependent upon Him. As Christians, the degree to which we recognize our dependence on God is apparent in our prayer life. That is true not only for each of us individually, but also for us, collectively, as a church. When we believe we are not dependent on God, we will also see no need to pray. When, however, we realize our total dependence on God, we will be driven to our knees in prayer. Luke wants us to see that kind of dependence in this week’s passage from the book of Acts. This week’s passage contains the longest prayer in the entire book and it shows us how God provides for the Church in response to its prayers. 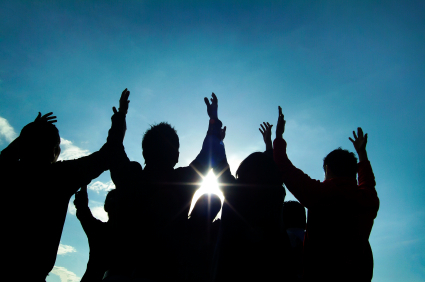 We can be like that early Church and recognize the power of prayer. Not that the prayer itself has power, but through Christ and in the Holy Spirit prayer brings us into the presence of the Father who hears our prayers. Our own movement forward, as a church, will depend on that power. That’s why, beginning this Sunday morning, we are providing an opportunity to seek the Holy Spirit through our collective prayer. Matt Kantrowitz will be leading that prayer group in Stark Hall during the Sunday school hour, beginning at 9:15. We need pray-ers! We need you to join us in prayer! Will you consider joining us then as we declare our dependence on God? Then join us for worship on Sunday morning at 10:30 as we look to God’s word for direction and encouragement in dealing with this challenging issue of prayer. 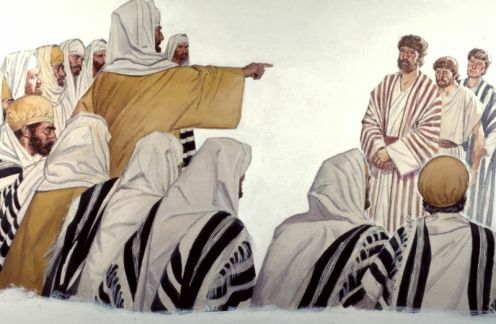 We are only in the fourth chapter of Acts and yet the heat is already turning up on the disciples. The church faces its first instance of persecution in this week’s passage and it makes me wonder, “Can we expect this to happen to us here in Goffstown and how would you and I hold up?” I’ve been focusing a lot of my preparation for this week’s message on answering those questions and a few others. What do we think about suffering and persecution? I have to admit, I am not crazy about either one. I don’t think it is just me. Our culture seeks to avoid suffering at all cost. Suffering is viewed as undesirable and we can even say, from a biblical perspective, that suffering is one result of the fallen world that we live in. Yet, James tells us to “consider it pure joy” when we experience trials. It’s kind of hard to wrap your head around that, isn’t it. Yet, we know and can each probably point to more than one instance where God ultimately used suffering for our own good. Suffering and persesecution of Christ’s Church in no way thwarts God’s sovereign plans. In fact, it is usually under these circumstances that the church multiplies rapidly and the faith of Christ’s disciples is emboldended. . This week going to learn about a specific kind of suffering: suffering when acting out our faith in Jesus Christ. We’ll see that Peter and John suffered specifically because they were bold and courageous in acting out their faith in Jesus. That’s something not many of us, I suspect, can say we have rarely suffered for. But should we? Will we? How can we? 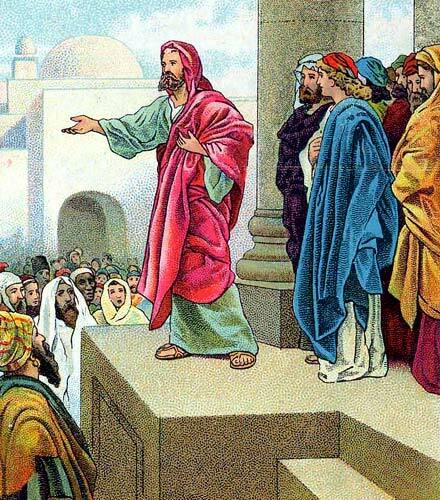 Opposition sometimes shows up in places where we least expect it, yet there is no shortage of opposition to the Gospel in our pluralistic society. Join me on Sunday morning as we look to God’s word for encouragement in dealing with this challenging topic!